A Halifax building, built in the 1900’s, welcomed the mayor and mayoress of Calderdale to open its newly renovated roof-top garden. Business partners, Vicky and Brian Nolan began the £1m refurbishment of Croft Myl in 2015 and have since provided 40 local businesses with vibrant office space. The Mayor, Marcus Thompson and Mayoress, Nicky Chance-Thompson cut the red ribbon to officially mark the regeneration of what was once an unusable and derelict building. The roof-top garden and penthouse suite, which has taken 12-months to build, features glass pods and a unique slide, offering tenants an alternative way to reach the penthouses offices below. Vicky and Brian Nolan designed the award-winning office space with local SME’s in mind; having struggled to find a suitable headquarters for their electrical and fire safety business, Circuit Compliance. The first of its kind, Croft Myl provides “no-ties” contracts for its residents. Current tenants include Andys Man Club, Wright Angle Marketing, Kip Mcgrath, Zenith Wealth Management, Woodhall Mortgages, Snowflake Media and many others. Vicky Nolan said: “What a fantastic way to start the year. We’re absolutely thrilled to have welcomed our valued tenants and other local professionals to the opening of our roof-top garden. We hope this fantastic space will be enjoyed many this summer. 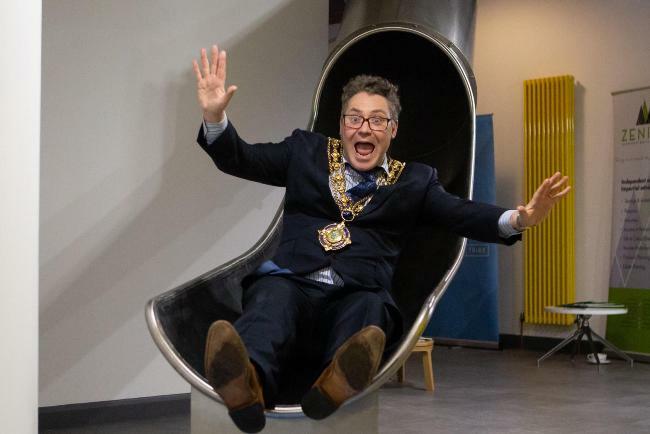 “Having the mayor and mayoress there to celebrate the opening was brilliant and we were very pleased to give them a little push down the roof-top slide!